Rock Climbing requires strength, flexibility, and the ability to lift your own body weight up the mountain. The Total Gym, much like rock climbing, also utilizes body weight as its primary form of resistance. Additionally, the Total Gym helps build functional strength while increasing flexibility as you move from one exercise to the next. With its ability to simulate many of the same movements as climbing, the Total Gym is an excellent training tool for rock climbing. So whether you are an inspiring climber, or an expert who has been climbing for many years, the Total Gym will help you boost your mountain climbing capabilities! I’ve put together a series of exercises using the Total Gym that you can add to your rock climbing training. These exercises are just a snapshot of what you can do with the Total Gym, but provide a good basis to get started with your training. Set your training goal to complete at least 2 sets of these exercises, targeting 12 to 15 repetitions per exercise, and perform these at least 4 times a week. Pull ups are a staple exercise to help improve rock climbing. The Total Gym offers pull up bars as an accessory, or for the exercise I’m demonstrating, I’m using the handles with the pulley system attached to the glide board. This set up allows me to start with a standard pull up, for roughly 12 to 15 reps. Then, I’ll extend the motion into a full extension pull up as a superset to the standard pull up. For this exercise, my hands start from over my head, but instead of stopping in front of my chest, I’ll extend my arms down by my hips. The additional extension activates my rotator cuffs and triceps. Typically, I’ll perform about 12 to 15 full extension pull ups to complete the exercise. The benefit of extending the pull up is that my back, rotators and triceps are all firing through one continuous motion! For an added challenge, this can also be done one arm at a time. 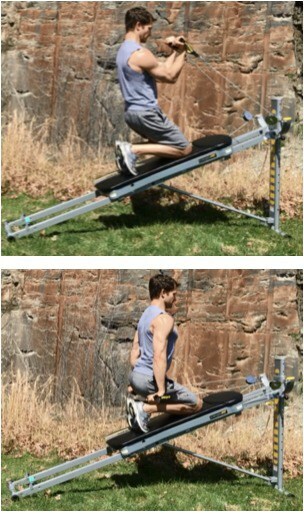 This exercise starts seated on the glide board facing the side. This could be done kneeling as well (which is slightly more challenging). 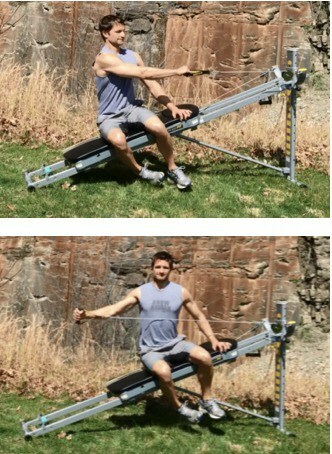 I’ll start with a standard single-arm side (cross over) row, with my hand stopping at the middle of my chest. Adding a slight twist keeps my core engaged. 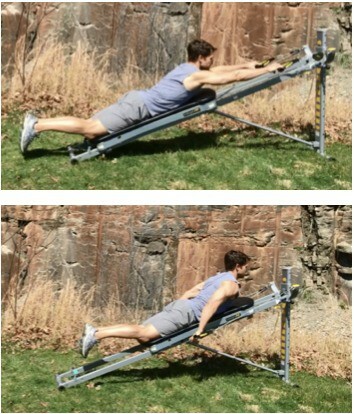 After performing about 12 to 15 of these standard rows, I’ll extend my arm outward to my side to complete the full extension row. I’ll finish about 12 to 15 of these as a superset. The full extension row activates portions of the back, shoulders/deltoids, rotator cuffs, core, and triceps. When I complete this exercise, I focus on keeping my chest up the entire time. It’s easy to want to slouch, so I try not forgot about proper form! Now, we are going to step it up a notch as we add some lower body training with the upper body stability work! I’ll start this off with a standard push up. Then I’ll hop to a frog position similar to a burpee. Instead of jumping up, I’ll extend out and grab the middle of the glide board (the glide board should not move). My legs then hop to the frog position onto the bottom of the glide board. Then I’ll bring my hands to the top of the glide board and lengthen into a plank position. Reversing the same process back to the push up position completes the exercise, then repeat! Start this slow until you get the process down. Then you’re good to go for at least 15 reps. 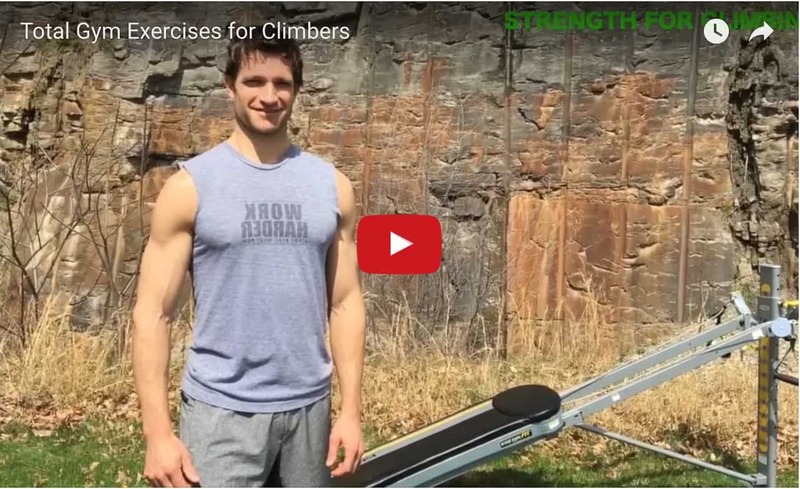 There are a couple extra tips to note while doing this exercise that will benefit your rock climbing skills. First, focus on getting your hips up near your hands during your frog/ burpee hops. This trains your hips to stay forward, which will help you stay close to the mountain when climbing. When you’re able to stay close to the mountain, it’s easier to hang on and you’ll have more leverage with your legs to climb! Second, practice making smooth transitions with each movement. Rock climbing requires smooth and deliberate movements. The next exercise will add some intensity to the everyday lunge, where the inclined glide board can serve as a perfectly shaped step. This is another functional drill that requires some balance and coordination of your upper and lower body. It will also help strengthen your hamstrings and quadriceps. I target 12 to 15 reps for each leg (24 to 30 total) to complete the exercise. I’ll start the exercise by standing to one side of the glide board and will place my inside leg on the glide board (at the bottom so the glide board doesn’t move). With a gradual lunge forward I can grab the middle of the glide board and will hop the other leg on the glide board and I’m back to the same position on the other side. Then I’ll repeat! 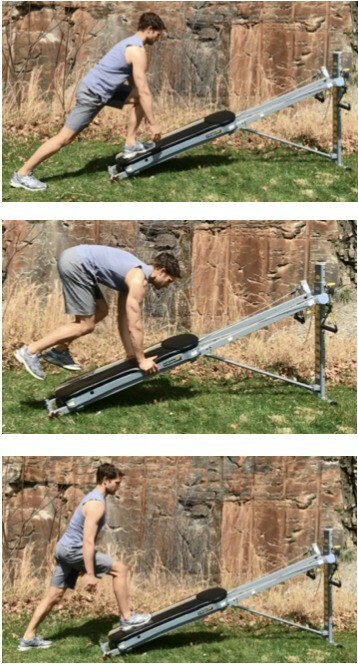 Just a tip before attempting this: set the glide board to a high level setting to ensure it doesn’t move when you perform the exercise. Grip strength is critical for rock climbers. So for this last exercise, we are going to target the wrists. There’s a couple ways to accomplish wrist curls and extensions on the Total Gym. Start from a kneeling position with your arm out and a contracted bicep (curling at a 90 degree angle) with your palms facing you. Perform the wrist curl while keeping arms still. In addition to my wrists, this exercise will also target my biceps and core by maintaining the correct form. As an alternative to this exercise, I’ll move my hands down by my hips in a low kneeling position. The wrist curl can be performed from here and by reversing the hand position (palms facing in front of me), I can also perform wrist extensions. Just a note that wrist extensions are slightly more difficult to do than wrist curls so adjust your incline to a lower position to accommodate for this if needed! Best of luck with your rock climbing training! Be sure to add these exercises using the Total Gym to improve your strength and flexibility as you maneuver up the mountain! I hope you will also see that this helps with overall coordination, will prevent injury, and will make your overall climbing experience much more enjoyable as well! Very unique ways to use the total gym to improve your rock climbing abilities. 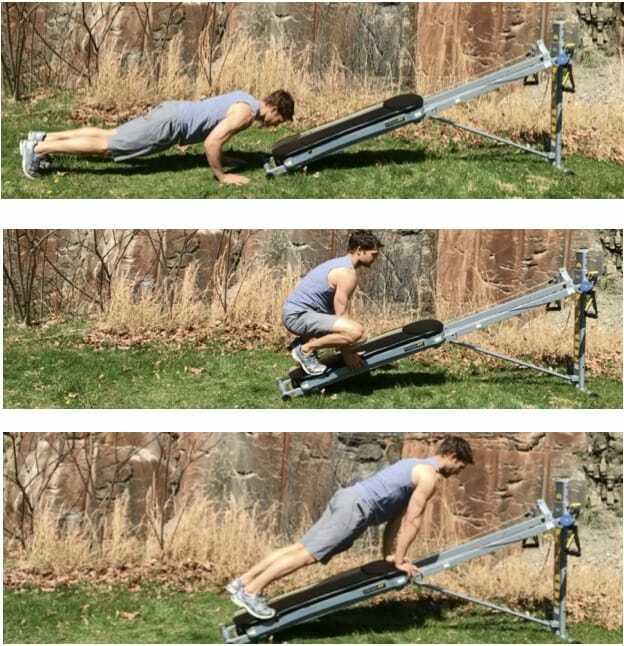 The 1 arm extension row looks interesting, thanks for the awesome post!